Lewis Hamilton has put Mercedes return to form down to an open-minded approach to problem solving. Hamilton took his first pole position since the opening round in Australia at the Spanish Grand Prix, beating teammate Valtteri Bottas to the top spot by 0.040s. After three races struggling for one-lap pace, the return to a high-speed circuit with high-energy corners appeared to suit the Mercedes, but Hamilton credits his team’s creative approach to problem solving for his return to the front this weekend. “Definitely the team has been working so hard, so a huge thank you to everyone working hard back at the factory,” he said. “We really tried to continue to understand and be open-minded, it is easy for us to get stuck in our ways, and we definitely let loose and be open-minded to try to improve which is great. That is what it takes to be a winning team. “It was a very close qualifying. You could see all weekend that Ferrari were clearly sand-bagging because they knew they had a quick car, but it took everything from us to get this result and to get the 1-2 in qualifying is fantastic for the team. 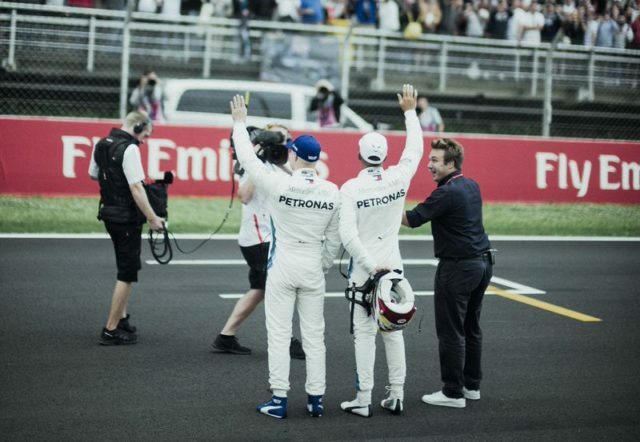 Hamilton was only four hundredths of a second faster than his team mate Valtteri Bottas, who will start alongside him on the front row for tomorrow’s race. The Finn was disappointed to lose out by such a slender margin, but otherwise sounded happy with the day’s work. “It was so close today in Barcelona like it’s been all weekend,” said Bottas. “Good fun. I ruined my first run in Q3. So I only had one chance in the last run. Got a decent lap, but it’s a shame it’s only four hundred. “For us it was a perfect result today,” he added. “But the race is tomorrow. We’ll race hard and try and get the 1-2 we deserved in Baku.